The 2018 State of the Salmon report by the Governor's Salmon Recovery Office paints a sobering picture. After 20 years and nearly $1 billion spent on Washington state salmon recovery programs, most salmon are still in decline, a state report has found. The 2018 State of the Salmon report by the Governor’s Salmon Recovery Office is a sobering read: Across the state, and in its jewel, Puget Sound, salmon are struggling to survive despite efforts of every kind to prevent extinction. The news isn’t all bad: some runs, such as summer chum on the Hood Canal and fall chinook in the Snake River are doing better and near their recovery goals. And habitat restoration, from taking out dikes to fixing highway culverts that block salmon migration boosts salmon populations, the report found. The problem is that more habitat is being destroyed, more quickly than it can be fixed as the state continues a turbocharged growth spurt that is chewing up salmon habitat with roads, pavement, housing and commercial development. Much of that growth has come at the expense of salmon and the animals that depend on them, including southern resident killer whales, also at risk of extinction. “The faster we dig, the deeper we get,” said Steve Martin, executive coordinator of the governor’s Salmon Recovery Office. Recovery work — and the money to pay for it — is not keeping pace with the need, Martin said. The under-investment is similar to paying too little to a retirement account — or not doing what the doctor ordered to stay healthy, Martin said. In the past 10 years, regional salmon recovery organizations also received only 16 percent of the funding documented to be needed to repair habitat damage. Nearly $5 billion is needed to fix what’s broken, according to the report and a news release issued by the state of Washington Recreation and Conservation Office. Meanwhile, as impervious surfaces increase in the region, salmon populations decrease. Coho salmon are particularly susceptible. In the past decade, up to 90 percent of coho salmon in urban streams in the Puget Sound watershed died before they could spawn because of toxic stormwater runoff. Armored shorelines destroy the food web near shore for salmon, and eliminate important travel and resting places for juvenile salmon. In most of the state, salmon are below recovery goals set in federally approved recovery plans. Of 15 runs at risk of extinction, eight are not making progress or declining. Five show signs of progress, but still aren’t making recovery goals. Only two runs statewide, summer chum in Hood Canal and fall chinook in the Snake River, are approaching recovery goals. As fish runs decline, fishing opportunity also is greatly reduced. Harvest of coho has fallen from a high of nearly 3 million fish in 1976 to less than half a million fish in 2017, according to the Washington state Department of Fish and Wildlife. Chinook catches are also down, with nearly 1 million chinook caught in 1973 and only about half of that in 2017. 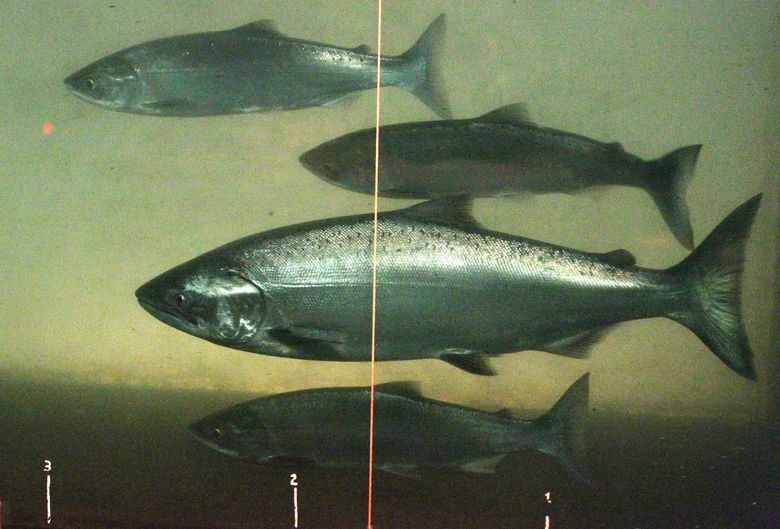 To make progress much needs to be done, the report found, from addressing climate change to repairing highway culverts that block salmon passage, to improving salmon passage at dams and reforming harvest and hatchery practices. Kaleen Cottingham, director of the Recreation and Conservation Office, home to the salmon recovery office, said she remains optimistic. The report also calls for stronger land use regulations and more enforcement of those regulations to protect shorelines and improve fish passage and water quality. Lynda V. Mapes: 206-464-2515 or lmapes@seattletimes.com; on Twitter: @LyndaVMapes. Lynda specializes in coverage of the environment, natural history, and Native American tribes.